Israel’s Security Minister Gilad Erdan has called for international observers to be expelled from Hebron. Erdan yesterday sent a letter to Israeli Prime Minister Benjamin Netanyahu, demanding that he end the mandate of the Temporary International Presence in Hebron (TIPH), in the south of the occupied West Bank. According to the Jerusalem Post, Erdan claimed that the mission is “hostile to Israel rather than a neutral force, and is harmful to both the Israeli soldiers stationed in Hebron and the [illegal] Jewish settlers that live there”. Erdan reportedly gave Netanyahu a secret police report “with data to back up his assertion”. It is no wonder that a force, composed of policemen from a hostile Islamic state such as Turkey and pro-Palestinian countries that sponsor boycotts [of Israel] such as Sweden and Norway, interferes with IDF soldiers and police, creates friction with the settlers, cooperates with radical organizations and promotes the delegitimization of Israel. The TIPH – a civilian observer mission which has been present in Hebron since 1997 – has a mandate which is renewed every six months by the Palestinian Authority (PA) and Israel. The mission’s current mandate ends in 14 days, which likely explains the timing of Erdan’s appeal. In doing so, he joins the right-wing campaign led by Deputy Foreign Minister, Tzipi Hotovely, to pressure Netanyahu to end the mission’s mandate. In November, Netanyahu said he would review the mission’s status in December, but made no public statement on the issue. The mission was formed in the aftermath of a massacre committed by Jewish extremist rabbi, Baruch Goldstein, who killed 30 Palestinian worshippers during their morning prayers at the Ibrahimi Mosque in Hebron. Palestinian detainee and cancer victim Sami Abu-Diak has lost a great amount of weight and is no longer able to eat or drink, the Detainees Affairs Commission said on Thursday. Karim Ajwa, the Commission’s attorney, said Abu-Diak has also lost the ability to sleep and can no longer walk. He is also suffering severe stomach pain as a result of the advanced stage of cancer he is suffering. 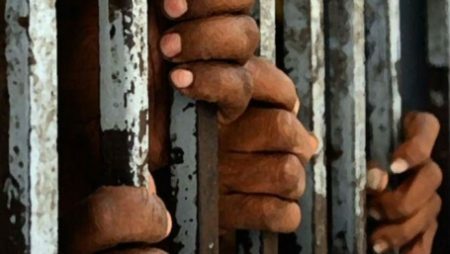 Abu-Diak, who comes from the town of Silat al-Dahr in the West Bank, is serving a life sentence, and so far served 18 years in jail, according to WAFA. He underwent surgery in September of 2015, at the Soroka Hospital in Israel, during which 80 cm of his intestine was removed. He suffered a medical error during the surgery, resulting in kidney and lung failure, along with other serious health complications. 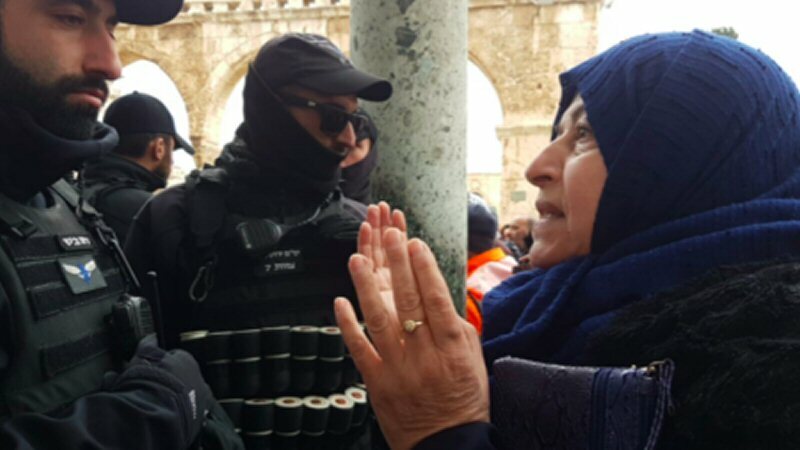 A Palestinian woman protests Israeli police activity at al-Aqsa Mosque, January 14, 2019. .
Palestinians refuse an attempt by Israeli police to enter a mosque in al-Aqsa Compound. Israeli police besieged the mosque for six hours and arrested four Palestinians. On Monday, January 14, 2019, Palestinians worshippers closed the doors to the Dome of the Rock Mosque and barricaded themselves inside of it in protest of Israeli police activity at al-Aqsa Compound in Jerusalem. The Middle East Monitor reports that the protest erupted after an Israeli police officer attempted to enter the Dome of the Rock Mosque while wearing a kippah. “The Dome of the Rock guards asked the policeman to remove his kippah before entering the mosque, but he refused and insisted on entering by force. The guards closed the mosque’s gates and sealed themselves inside as the police waited outside to arrest them,” said Firas al-Dibs, spokesperson for the Islamic Waqf. During the siege, Palestinians staged a sit-in in the yard of the Mosque. Israeli police pushed the protesting worshippers. Director of the Mosque Sheikh Omar Al Kiswani was lightly wounded. When the afternoon call to prayer was sounded, Israeli forces withdrew and Palestinian worshippers streamed into the Mosque. The siege lasted for a total of six hours, reports the Wadi Hilweh Information Center, and at least four Islamic Waqf guards were arrested. Israeli authorities released the four guards from detention later that day with orders to stay away from al-Aqsa for one week and report back to the Israeli police on Sunday. The next day, Tuesday, January 15, Israeli police summoned al-Dibs for interrogation. Israeli police arrested Al-Dibs earlier this month. The Wadi Hilweh Information Center reports that on Wednesday and Thursday Israeli settlers toured al-Aqsa compound with the protection of Israeli police. The Islamic Waqf is responsible for maintaining al-Aqsa’s “status quo,” an agreement reached between Israel and Jordan following the 1967 Israeli occupation of Jerusalem. The agreement stipulates that al-Aqsa is reserved for Muslims worship, though people of other religions may visit the holy site as a sightseeing activity. Palestinians and Waqf officials warn that Israeli settler and police incursions are a step toward unilaterally changing the political status quo of al-Aqsa and occupied Jerusalem. Ahmad Jaradat is Senior Project Coordinator for the Alternative Information Center (AIC). 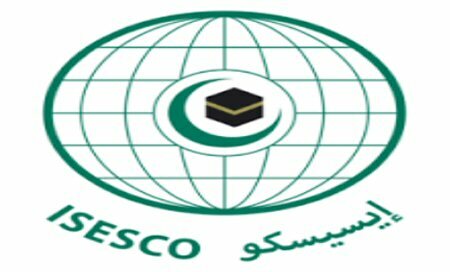 The Islamic Educational, Scientific and Cultural Organization (ISESCO) has condemned Israeli occupation authorities’ scheme to destroy a 1,200-year-old archaeological site in an Arab town to the north of occupied Jerusalem, as a means to build a logistic center for the “Modi’in” settlement. ISESCO stated, according to Al Ray, that this criminal scheme is a destruction of the Palestinian cultural heritage, an assault on its historic memory, and a disrespect for the international conventions and declarations relevant to cultural heritage. The organization called upon International organizations, particularly the UNESCO, to intervene in stopping this criminal act and to protect the Palestinian heritage from being destroyed by Israeli authorities. It is worthy to mention that the site was unearthed by Israeli archaeologists, and turned out to be a prosperous town from the early Islamic period. Israeli forces continued with systematic crimes, in the occupied Palestinian territory (oPt), for the week of 10 – 16 January, 2019. Israeli forces continued to use excessive force against peaceful protestors in the Gaza Strip. A woman and a child were killed during the 42nd week of the Return and Breaking the Siege March. 143 civilians, including 34 children, 3 women, 3 journalists, and 3 paramedics, were wounded; the injury of 3 of them were reported as serious. In the Gaza Strip, the Israeli forces continued to use lethal force against the participants in the peaceful protests organized along the Gaza Strip borders, which witnessed the peaceful protests for the 42nd week along the eastern and northern border area of the Gaza Strip. In the Gaza Strip, the Israeli forces killed 2 Palestinian, including a child and woman, and wounded 143 civilians, including 34 children, 3 women, 3 journalists, and 3 paramedics. The injury of 3 of those wounded was reported serious. In the West Bank, the Israeli forces wounded 7 civilians, including 2 journalists and a paramedic in separate shooting incidents. In the Gaza Strip, On 11 January 2019, the Israeli forces killed Amal al-Termasi (44) from al-Sheikh Redwan in Gaza City after she was hit with a bullet to the head at approximately 15:50. At the time of being wounded, she was around 200 meters away from the border fence between the Gaza Strip and Israeli in eastern Gaza City. At approximately 05:00 on Monday, 14 January 2019, medical sources at al-Shifa Hospital in Gaza City, declared the death of ‘Abdel Ra’ouf Salhah (13) from Block 8 Street in Jabalia refugee camp, succumbing to wounds he sustained in the northern Gaza Strip in 11 November 2019. The above-mentioned child was directly hit to the left side of his head with a teargas canister, causing acute bleeding and laceration in the brain in addition to a swelling. As a result, he was taken for treatment in al-Shifa Hospital, where he stayed in the Intensive Care Unit (ICU) until his death was declared. As part of using excessive force against the peaceful protesters along the Gaza Strip borders, during the reporting period, Israeli forces wounded 143 civilians, including 34 children, 3 women, 3 journalists, and 3 paramedics. The injury of 3 of those wounded was reported serious. As part of targeting the Palestinian fishermen in the sea, the Israeli forces continued to escalate their attacks against the Palestinian fishermen, indicating the on-going Israeli policy to target their livelihoods. During the reporting period, PCHR documented 6 incidents that resulted in the arrest of 2 sibling fishermen and confiscation of their boats. As part of targeting the border areas, on 10 January 2019, Israeli soldiers opened fire at the border area adjacent to the border fence between the Gaza Strip and Israel in eastern al-Shija’iyah neighbourhood in eastern Gaza City. On 11 January 2019, Israeli forces fired an artillery shell at a border control point belonging to al-Qassam Brigades in the vicinity of the Return Encampment in Malaka area in eastern Gaza City. On 12 January 2019, Israeli soldiers opened fire at farmers and shepherds in eastern Deir al-Balah in central Gaza Strip and eastern Jabalia in the northern Gaza Strip. Meanwhile, the Israeli forces fired artielly shells at a border control point belonging to al-Qassam Brigades in eastern Shija’iyah neighbourhood in estern Gaza City. On 13 January 2019, Israeli forces sporadically opened fire at farmers and shepherds in the northern Gaza Strip. On 16 January 2019, Israeli soldiers stationed along the border fence between the Gaza Strip and Israel opened fire at the agricultural lands in eastern al-Maghazi and Deir al-Balah in the central Gaza Strip, but no casualties were reported. As part of the airstrikes, on 12 January 2019, Israeli warplanes carried out 4 airstrikes launching 7 missiles at vacant lands and a border control point belonging to the Palestinian armed groups in eastern al-Shija’iyah neighbourhood in eastern Gaza City in the vicinity of al-Rayes Mount in north-eastern al-Tofah neighbourhood. However, no casualties were reported. On 13 January 2019, Israeli drones fired 2 missiles at a border control point in eastern Khuza’ah village, east of Khan Younis City. No casualties were reported. In the West Bank, during the reporting period, Israeli forces wounded 7 Palestinian civilians, including 2 journalists and a paramedic, in separate shooting incidents. During the reporting period, Israeli forces conducted at least 100 military incursions into Palestinian communities in the West Bank and 4 similar incursions into Jerusalem and its suburbs. During those incursions, Israeli forces arrested at least 62 Palestinians, including 9 children, in the West Bank. Moreover, 11 others, including a child, were arrested in Jerusalem and its suburbs. In the Gaza Strip, on 15 January 2019, Israeli forces moved 100 meters into Landfill area, north of the Agriculture School in northern Beit Hanoun in the northern Gaza Strip. On 16 January 2019, they also moved 100 meters into the western side of the border fence with Israel opposite to the Memorial Site in the south-eastern side of Beit Hanoun in the northern Gaza Strip. They levelled and combed lands that were previously levelled amidst sporadic shooting. However, no casualties or damage to property was reported. As part of Seizure of Palestinian Civilians’ property in favour of settlement assocaitions, On Thursday morning, 10 January 2019, the Israeli Law Enforcement Department handed al-Sabagh family a notice to evacuate their building, which shelters 5 families, including 45 persons. The Israeli Execution and Procedure Department gave the family until 21 January 2019 to evacuate the building. Mohammad al-Sabbagh (65) said that this notice came to implement Magistrate’s Court decision against al-Sabbagh family and in favor of settlers. This order came after the Israeli Supreme Court rejected the family’s lawyer request to open Sheikh Jarrah’s ownership file and request for a 5-judge panel instead of 3. Mohammad al-Sabbagh confirmed that 48 families are threatened to be expelled in Karm al-Ja’ouni area in Sheikh Jarrah, where al-Sabbagh family lives from 1956. Al-Sabbagh family is one of 19 others who have cases pending in the Israeli courts. The settlement associations seek to expel Palestinian civilians from the aforementioned neighborhood. As part of settlement crimes and demolitions, 16 January 2016, Israeli forces demolished a house belonging to ‘Abed al-Hadi ‘Ali ‘Abiat (40), in Fasayil village, north of Jericho, under the pretext of non-licensing. ‘Abed al-Hadi said to PCHR’s fieldworker that the Israeli forces accompanied with military bulldozers moved into the village and surrounded his house without a prior warning. They forcibly got him and his children out of the house and then completely demolished the house. He added that his house was comprised of a 30-sqaure-meter room built with concrete and roofed with tin plates. Following that, the Israeli forces moved into al-Nwei’amah village, north of Jericho, where they surrounded a house belonging to Soliman Abu Kharbeish and completely demolished it. The house was comprised of 3 rooms, a kitchen and bathroom. As part of the Israeli settlers’ attacks against the Palestinians civilians and their property, PCHR’s fieldworkers documented during the reporting period 6 attacks carried out by Israeli settlers. As a result, 1200 forest tree seedlings were damaged, a civilian car sustained damage and a Fieldworker at “B’tselem’” sustained wounds to his left leg and right hand after he was attacked by one of the Israeli settlers’ dogs in Um al-‘Omar area, east of Yata in southern Hebron. Gaza City: Israeli forces killed Amal Mustafa al-Termassy (44) from al-Sheikh Redwan neighborhood in Gaza City after being hit with a live bullet to the head at approximately 15:50 while she was 200 meters away western the border fence with Israel. Moreover, the Israeli forces wounded 70 civilians, including 16 children and a journalist. Forty-nine civilians were hit with live bullets, 20 were directly hit with tear gas canisters and a civilian was hit with a rubber bullet. The wounded journalist namely Hussain ‘Abed al-Jawad Karssou’ (43) who works as a photojournalist at Global News, was hit with a tear gas canister to the head. 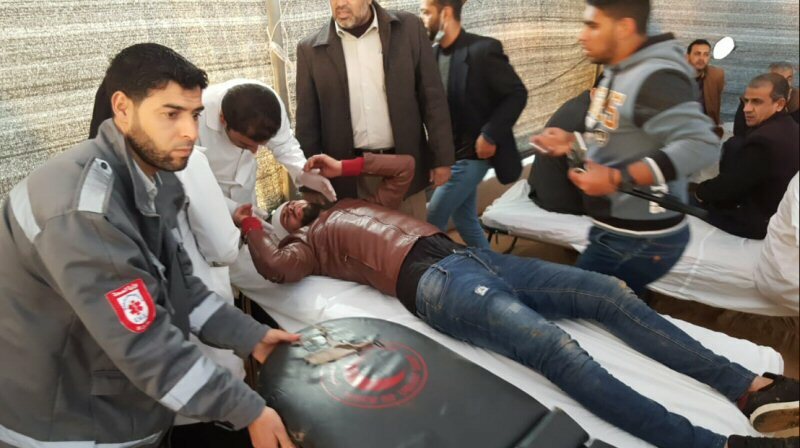 Northern Gaza Strip: The Israeli shooting at Palestinian demonstrates resulted in the injury of 23 civilians, including 8 children and a paramedic. Six of them were hit with live bullets and shrapnel and 17 were directly hit with tear gas canisters. The injury of one of them namely ‘Abed al-Ra’oof Isma’il Mohammed Salha (13) from Jabalia refugee camp, was classified as critical. The wounded child was directly hit with a tear gas canister to the left side of the head, which resulted in severe bleeding and brain swelling and laceration. He was taken to al-Shifa Hospital in Gaza, where he was admitted to intensive care unit (ICU) until his death was declared at approximately 05:00 on Monday, 14 January 2019. The wounded paramedic, Anas ‘Abed al-Latif Salha (26), who works at the Palestinian Medical Relief Society, was hit with a tear gas canister to the left hand. 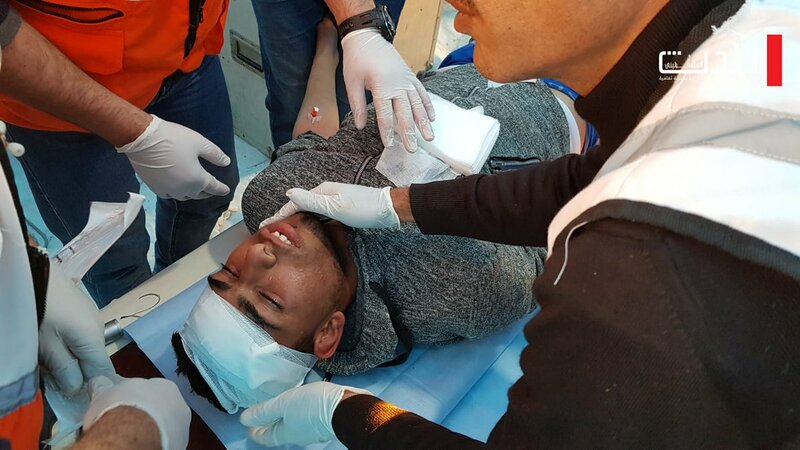 Khan Younis: The Israeli shooting at Palestinian demonstrates resulted in the injury of 23 civilians, including 4 children and a paramedic identified as Mustafa ‘Emad al-Senwar (22). Mustafa is a volunteer at and was hit with a tear gas canister to the neck. He was then admitted to the ICU at the Gaza European Hospital due to his serious health condition. It should be noted that last week, he was also hit with a tear gas canister to the right thigh. Rafah: 13 civilians, including 3 children, were wounded. 3 of them were hit with live bullets and shrapnel and 10 were directly hit with tear gas canisters. Moreover, an ambulance belonging to the Ministry of Health was hit with a live bullet damaging its rear window. The injury of one of the wounded civilians was classified as serious. At approximately 13:30 on Friday, 11 January 2019, started from the center of Kafur Qaddoum village, northeast of Qalqiliyia, and then headed towards the eastern entrance to the village, which was closed from 15 days in favor of “Kedumim” settlement. The demonstrators chanted national slogans calling for ending occupation and condemning the Israeli forces‘crimes committed against Palestinian civilians in the Gaza Strip. The demonstrators threw stones at the Israeli soldiers stationed behind sand berms. The Israeli soldiers fired sound bombs, rubber bullets and tear gas canisters at them. As a result, a photojournalist J’afar Zahed Ishtaya (46) was hit with a tear gas canister to the right leg. At approximately 15:00, on Tuesday, 19 January 2019, Israeli Police raided and searched a house yard belonging to Kareem Dawoud Hussein (30), from Mukaber Mount village, south of occupied East Jerusalem, in search for surveillance cameras. When the aforementioned civilian refused to allow them to enter the house without a court order, the police officers hit him on the head. As a result, he sustained wounds and then fainted. He was then taken into the hospital, where he was diagnosed with a concussion. Kareem said that Ali Marwan lkalouti (26), his brother-in-law, who came to the house when he heard shouting, was arrested at 16:00 and released on bail at 22:00. The Israeli forces imposed a house arrest on ‘Ali for 3 days. Kareem also confirmed that his father Daoud Mohammad Hussein (70), was beaten when he tried to protect his son and refused to let them arrest him. Later, additional police officers were called for backup and they beat everyone in the yard. In addition, Kareem said that his wife Iman Abdul Latif Younis (28), a 3-month pregnant woman, was pushed when she was trying to reach her husband lying on the ground, unconscious and bleeding from the head. She was then taken to the hospital as she suffered a lot of pain and almost lost the child and remained for monitoring for 5 hours. At approximately 09:25, on Monday 14 January 2019, a police officer attempted to enter the Dome of the Rock wearing a kippah, which is a symbol of Judaism. When al-Aqsa guards attempted to prevent him, Israeli forces raided the Dome of the Rock, closed it for 5 hours, prevented the worshipers from performing prayers and locked several guards and worshipper inside after closing the gates. At approximately 12:30, while worshipers gathered to protest against what happened, Sheikh ‘Omar Kiswani, director of al-Aqsa mosque, was severely beaten and then taken to the hospital. At 15:30, Dome of the Rock’s gates were reopened and the worshipers were allowed to perform prayers. Following that, the Israeli forces arrested 4 guards belonging to the Islamic Endowment Department (Awqaf). The guards were identified as Loai Abu Sa’ed, Yahia Shehada, Ahmad Abu ‘Alia and Fadi ‘Elian; and the civilian ‘Awad al-Salaima. On Monday evening, Israeli forces moved into Baten al-Hawa neighborhood in Silwan village, south of occupied East Jerusalem’s Old City. They raided 2 houses belonging to Adam Abu Ramouz (15) and Baha’ Rajabi (19) and then arrested both of them, taking them to an investigation center in the city. At approximately 02:00, on Wednesday, 16 January 2019, Israeli forces moved into Qalandia Refugee Camp, north of occupied East Jerusalem. They raided and searched 2 houses belonging to Omar Zaied (26) and Mohammad Hammad and then arrested both of them. Around the same time, Israeli forces moved into Qatanna village, northwest of occupied East Jerusalem. They raided and searched a house belonging to Rami Ossama ‘Eissa (21) and then arrested him. On Thursday morning, 10 January 2019, the Israeli Law Enforcement Department handed al-Sabagh family a notice to evacuate their building, which shelters 5 families, including 45 persons. The Israeli Execution and Procedure Department gave the family until 21 January 2019 to evacuate the building. Mohammad al-Sabbagh (65) said that this notice came to implement Magistrate’s Court decision against al-Sabbagh family and in favor of settlers. This order came after the Israeli Supreme Court rejected the family’s lawyer request to open Sheikh Jarrah’s ownership file and request for a 5-judge panel instead of 3. Mohammad al-Sabbagh confirmed that 48 families are threatened to be expelled in Karm al-Ja’ouni area in Sheikh Jarrah, where al-Sabbagh family lives from 1956. Al-Sabbagh family is one of 19 others who have cases pending in the Israeli courts. The settlement associations seek to expel Palestinian civilians from the aforementioned neighborhood. At approximately 10:00, on Monday, 14 January, Israeli forces backed by military vehicles and accompanied with a vehicle of the Israeli Civil Administration moved into Kherbit al-Jawaia, southeast of Yatta, south of Hebron. An Israeli Civil Administration officer handed Abdul Mutalib Hammad al-Nawaj’ a notice to stop construction works in an under-construction house built on an area of 100 square meters. Moreover, Moussa Hussein al-Shawaheen was handed a notice to stop construction works in a 60-sqaure-meter barrack and a water well, under the pretext of non-licensing. It should be noted that al-Jawaia area is located to the west of the bypass road (356) and adjacent to “Ma’oun” settlement established on civilians’ lands at the eastern side. Moreover, the Israeli authorities notify this area to stop construction works in addition to confiscating construction material as Khirbat al-Jawaia located within area classified as Area “C”. At approximately 06:00, on Wednesday, 16 January 2016, Israeli forces demolished a house belonging to ‘Abed al-Hadi ‘Ali ‘Abiat (40), in Fasayil village, north of Jericho, under the pretext of non-licensing. ‘Abed al-Hadi said to PCHR’s fieldworker that the Israeli forces accompanied with military bulldozers moved into the village and surrounded his house without a prior warning. They forcibly got him and his children out of the house and then completely demolished the house. He added that his house was comprised of a 30-sqaure-meter room built with concrete and roofed with tin plates. ‘Abed al-Hadi pointed out that the Israeli forces handed him a demolition notice on 11 September 2018. He filed a case against the demolition decision, but he was surprised that the decision was carried out before the completion of legal procedures. At approximately 12:30, on Thursday, 10 January 2019, dozens of Israeli settlers, under the Israeli forces’ protection, moved into ‘Ortah village, southeast of Nablus. The settlers performed their religious rituals in al-‘Auzairat in al-Sharda neighborhood in the center of Awarta. They damaged several tombstones of graves and later withdrew. At approximately 16:00, on Friday, 11 January 2019, a group of Israeli settlers, from “Homesh” settlement, northwest of Nablus, threw stones at a taxi belonging to al-Qassam Travel Company and damaged to its front and right side. The car is owned by Ahmad Jarra, from Jenin, and driven by Fareed M’arouf Fareed Jaber (48), from ‘Arraba, southwest of Nablus. Meanwhile, the car was coming back from Deir Sharaf village, west of Nablus, and heading to ‘Arraba village. Fareed’s wife, Sondos Mohammad Fareed Jaber (42), and their children Anas (11) and Hala (11) were with him in the taxi. They were then surprised with an ambush set up by 3 settlers, who were hiding behind a dumpster on the road at the entrance of the aforementioned settlement. They then threw big stones at them, causing fear among them. Around the same time, Israeli settlers, from “Homesh” settlement, damaged 1200 forest trees seedlings, which were handed in the Agriculture Ministry in Nablus, to the Council of Burqa village, northeast of Nablus, in order to plant them in al-Kubaibat area, northwest of Burqa village. The seedlings were damaged before planting them. At approximately 16:00, on Saturday, 12 January 2019, around 50 Israeli settlers gathered near the intersection of Taqqou’a village, southeast of Bethlehem. They then threw stones at the Palestinian vehicles. As a result, the Palestinian civilians were forced to stop at the entrance to Bethlehem until the settlers left late at night. At approximately 15:00, on Monday, 14 January 2019, 50 Israeli settlers, under the Israeli forces’ protection, moved into the western entrance to Taqqou’a village, southeast of Bethlehem, and closed it while chanting racist slogans and holding Israel’s flags. The Israeli forces closed the area and prevented Palestinian vehicles from access. An hour and a half later, the settlers left the area and no other incidents were reported. Israeli political sources circulated reports about “improvements” made by the US Administration to the initial text of the Middle East peace plan, including “amendments that allow the Arabs to agree to negotiate”. The reports noted that while the Americans considered these amendments “necessary to guarantee balance” between the two sides, Israelis believed they were in favor of the Palestinians. The Israeli sources gave the exclusivity of broadcasting the news to Israeli Reshet TV. The channel revealed that the amended US plan was based on documents entitled, “The Century Deal to Consolidate Peace in the Middle East.” It talks about the establishment of a Palestinian state on 85-90 percent of the occupied West Bank, with East Jerusalem as its Arab neighborhood as the capital, excluding the city’s old town, where the Al-Aqsa Mosque, the Church of the Resurrection and other holy places are located. The old town will be under Israeli control, but with a joint administration of Jordan and the Palestinian state. The report refers to a solution to the settlements based on dividing them into three categories: the first, including large blocs such as Gush Etzion (located on occupied Palestinian land stretching from Bethlehem to Hebron) and Ma’aleh Adumim (south of occupied East Jerusalem), and Ariel (in the Nablus area), and will be annexed to Israel in full, according to the US deal. The second includes a number of remote settlements, such as Itamar and Yitzhar, which accommodate a group of settlers of American origins known for their extremism and attacks on the Palestinians. They will remain in Israeli hands, even though they will be part of the Palestinian state. The third category of settlements, which include illegal outposts, will be evacuated. In exchange for the annexation of the settlements, Palestinians will be compensated by giving them land of the same size and value in the Triangle area – inhabited by Arab citizens (the Palestinians 1948) – adjacent to the West Bank. The reports noted that the US official did not address items in the US plan relating to the Gaza Strip and the refugee issue, and did not elaborate on whether the plan itself ignored the two issues or did not tackle them. In a Tweet, Greenblatt said the reports were inaccurate. He warned against issuing false or distorted information that would harm the peace process.